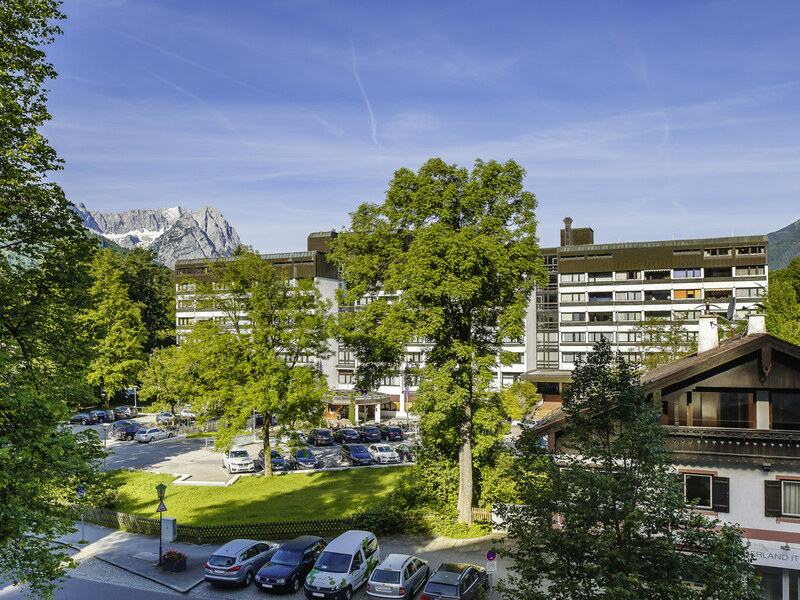 Treat yourself to a relaxing time in the Alps: The 4-star Mercure Hotel Garmisch-Partenkirchen has 117 rooms with WIFI. The leisure center with pool, fitness room and sauna is open for you from early to late. We recommend our conference area with seven meeting rooms for all your business and private events. Arrival: The train station is 0.9 miles (1.5 km) away from the hotel. Innsbruck and Munich airports are 37.3 miles (60 km) and 74.6 miles (120 km) away respectively. By car, take the A95 highway. Germany's highest Alpine ski resort is not only fantastic in winter but is also delightful in spring, summer and autumn too: The unique Alpine scenery, invigorating climate and natural bounty make Garmisch-Partenkirchen a popular holiday destination. At the 4-star Mercure Hotel Garmisch-Partenkirchen, you can choose between Standard Rooms with a single bed, two single beds, double bed or queen-size bed. The Privilege Rooms are equipped with a queen-size bed and Junior Suites with a double bed. We have a room available for guests with reduced mobility. All 117 rooms have WIFI access. Two children aged up to 12 may sleep in their parents' room free of charge. Your pet is also welcome (charge of EUR 11/night). The cozy Alt-Partenkirchen restaurant is just the place to get your strength up with delicious Bavarian cuisine. Between 6.30am and 10pm every day, regional delicacies are served on the outdoor terrace. Our Lüftlstube bar serves snacks, drinks, beer on tap and our exquisite Grands Vins Mercure wine selection from 5pm to 1am every day.